Hey you. Yeah, you there. I’ll bet you like kittens. It might be a little or you might already be wearing one on your t-shirt right now. If they’re not on your shirt, they might be on your socks. If they’re not on your socks, they’re probably on your mind. We know they’re definitely on OUR minds here at Tree House because it is just about to be kitten season. And what happens during kitten season? Kittens arrive. And then they need medical care. And food. And love. And they need to grow. Why? So we can spay and neuter them so they can go on to lead a long, fruitful life as someone’s best friend while not bearing any kitten-like fruit. Now, let’s talk about the rub, for there is indeed a rub: Kittens aren’t generally spayed or neutered until they’re at least 2 lbs, which is around two months or later, depending on their health when they come in, and they can’t be admitted to our colonies until they’ve had their surgeries and vaccinations. So, where do the kittens go from the time we get them until they’re ready? This is from your writer’s private stash of foster photos. That’s Tot. I fostered her for Tree House in 2014 and I got to watch her grow up as I got updates from her adopter. They were too young to survive without their mom. That word deserves its own paragraph because that’s how important it is. If you want to directly save a life, you foster. You see, if Tree House (or any rescue, for that matter) has open foster homes, we can pull more kittens from CACC because we know we have a safe place to keep them. If we have no place to keep them, we can’t pull as many. Every foster home equals AT LEAST one life saved. And if you take a whole litter of kittens? MORE lives saved! 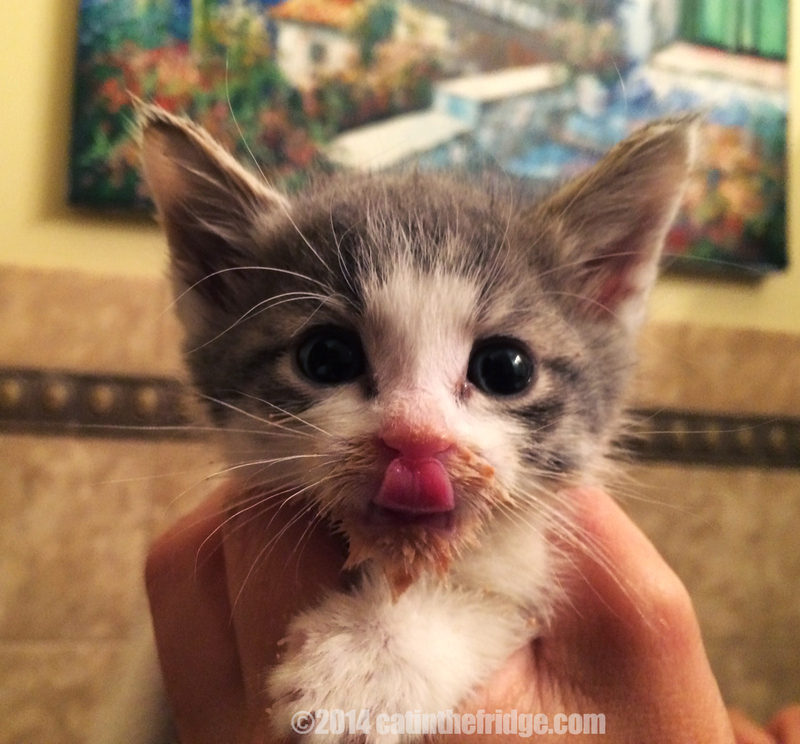 Tree House needs two things right now: Long-term fosters and emergency fosters. If you are able to keep newborn kittens in a safe place for up to 72 hours, we need you. Those 72 hours are crucial and give us a place to stash these little critters while we find them the other thing we’re looking for: long-term fosters. Our long term fosters will keep the kittens until they’re ready for the adoption floor. This is usually from 6 weeks to a few months. Imagine it: you watch them grow, you love them, you scoop their boxes, play with them, enjoy them, and then, you set them free. Not back into the street, obviously, but into Tree House where they’ll find the homes of their dreams, all because of you. We need you. THEY need you. Are you ready to save a life? Click here to start. 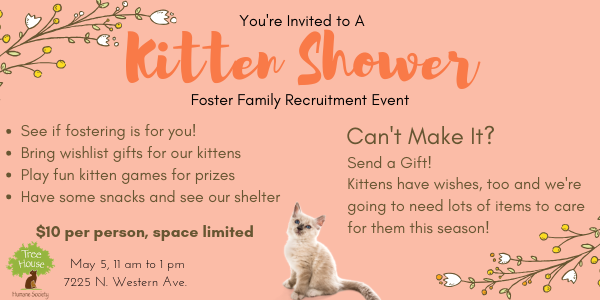 PS If you want a little experience before you accept your first foster friend, come to our Kitten Shower & Foster Recruitment Event this coming May 5, from 11 am to 1 pm. We’ll play some games, provide some foster information, have some snacks, and we MAY have a visit from some kittens. It’s $10 per person, RSVP required. Can’t make it? Send our little ones a gift. Kittens have wishes, too! Click here to view our Kitten Wishlist on Amazon.